Godfather's Panorama: Too Much Ado Over A Dead Gorilla? Too Much Ado Over A Dead Gorilla? Now, all I've been reading or viewing on the media is this gorilla shot in a zoo story. 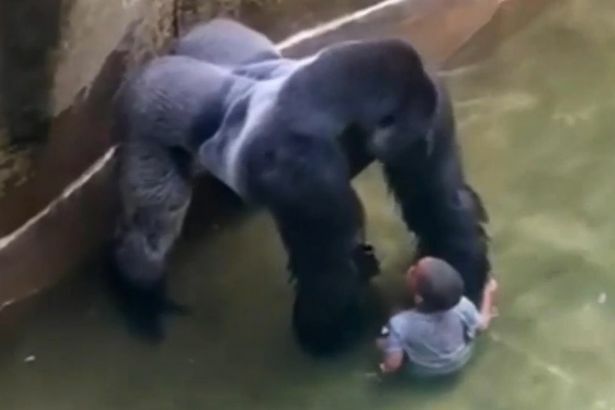 Yes, it is very regrettable that the zoo authorities felt they had to kill this gorilla to save the life of this child who somehow fell into the Gorilla Exhibit/Enclosure. Like many people had suggested, it would have been much better if the gorilla was tranquilized and the boy retrieved with no loss of life. If the zoo had no tranquilizer darts, that's the fault of the zoo keepers knowing that they have these wild animals and that accidents can and do happen. However, a lot of people are now viciously attacking the parents of the boy even calling for them to be prosecuted. Some are even bringing up the father's past criminal history, and the man wasn't even at the zoo on that day. Yes, some measure of blame for the mom is necessary - as a matter of fact, that was my first reaction upon hearing this sad story. How on earth could she allow herself to be this reckless that a child under her care managed to fall into a gorilla enclosure? But I think that people criticizing might be overdoing it now. 2) Most of these uber- animal lovers and endangered species fanatics will probably not react with the same or more vitriol if a human life was lost instead. Some measure of moderation is badly needed here. A good number of people clamoring for "justice" and weeping profusely over the premature loss of a gorilla life are the same people who would oppose the BLM movement, or turn a blind eye to other unnecessary loss of the lives of their own species.